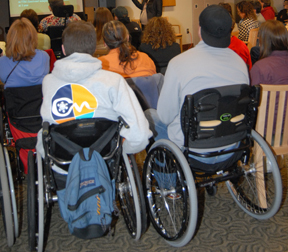 This SCI Forum consisted of presentations by two vocational counselors and a panel of six individuals with spinal cord injuries, moderated by Steve Stiens, MD, associate professor in the Department of Rehabilitation Medicine. 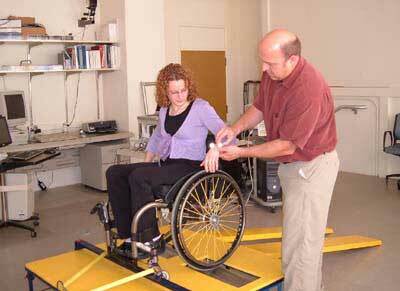 Presented on February 12, 2008 at the University of Washington Medical Center. Presentation time: 54 minutes. After watching, please complete our two-minute survey! The video starts with Michael Donofree, vocational rehabilitation counselor in the Veterans Administration, who discusses ways to contribute to your community while enhancing your quality of life through school, work and volunteering. 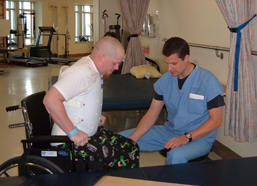 At minute 12:44, Tracy Zajac, a vocational rehabilitation counselor with the Washington State Department of Vocational Rehabilitation who also has a spinal cord injury, talks about her own post-injury training and employment and outlines the process of obtaining services from the DVR. At minute 22:25, six individuals with SCI talk about their adjustment to living with SCI and how they moved forward and found work, community involvement, and their passions in life. See the complete list of our SCI Forum videos at http://sci.washington.edu/info/forums/forum_videos.asp. Tough Times Never Last, But Tough People Do, by Robert H. Schuller (Thomas Nelson, 2007). The Passion Plan: A Step-by-Step Guide to Discovering, Developing and Living Your Passion. by Richard Y. Chang (Jossey Bass, 2000). A New Earth : Awakening to Your Life's Purpose by Eckhart Tolle (Dutton/Penguin Group, 2005).